A scour through the European fixtures, shortly thereafter, showed that CSKA would host Spartak Moscow at the Luzhniki Stadium that very weekend. The Russians would surely not care about Kate and Wills, and instead, I could watch two of the biggest teams in the Russian Premier League meet in the first derby of the season. A few stressful nights of filling in the Russian visa application later and I was set. Well, as set as I could be before preparing to spend the weekend alone with football fans notorious in their lust for violence and racism, in a country where I spoke none of the language. I arrived several days before the game, but immediately went about getting hold of a ticket. With the CSKA website less than helpful and my Russian stretching as far as 'privyet' (hello), I headed for the Luzhniki. 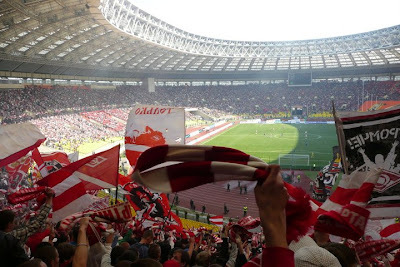 Luckily, the ticket office was fairly obvious at the front of the stadium, and after some deft pointing and motioning to indicate 'one', I emerged with a ticket that left me destined for the Spartak away end. Tickets for the game were reasonable, with my spot costing 400 rubles (slightly less than £9) and seats in the middle sections around 900 (£20). With capacity set at 78,000, tickets were easy enough to obtain from the ticket office, and prior to the game, there were numerous people trying to offload spare tickets. The ground was barely two-thirds full come kick off. 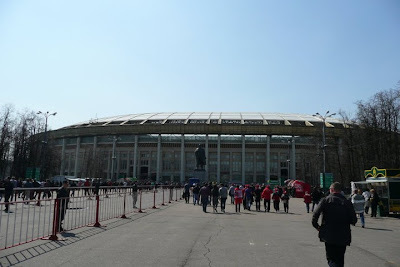 Most will know the Luzhniki as the venue for the 2008 Champions League final between Manchester United and Chelsea, although the complex was originally built to host the 1980 Moscow Olympics. The stadium is also set to hold the final of the 2018 World Cup. To my surprise, the area surrounding the arena was somewhat picturesque. Both the Olympic swimming pool and the Luzhniki Palace of Sports - home to the boxing and basketball competitions in 1980 - are close, by the bend of the Moskva River. The area also features a memorial to the 67 people killed in the controversial stadium disaster of 1982. The tragedy took place as Spartak took on Dutch side HFC Haarlem in the Uefa Cup, although unofficial reports suggest the death toll may have been in excess of that reported by the state. 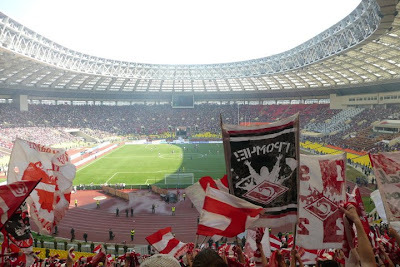 A more definitive account of the disaster can be read online, but the crush occurred after Spartak scored an injury time goal and fans headed towards the ground's only exit. As the melee intensified, those stuck at the exit attempted to return inside, but were stopped from coming back by the Militsiya. The death of what some speculate to be up to 340 people make it one of the very worst stadium disasters in history. 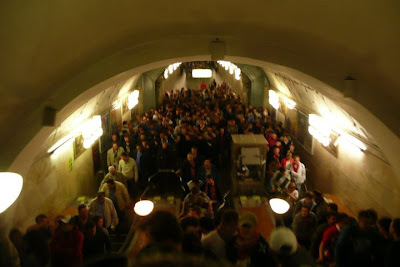 Skip forward a couple of days to the match and another ride on the spectacular Moscow metro. It's a good job each station is so unique, because I would have been lost in no time. Going underground, (going underground), well let the boys all sing and the boys all shout for tomorrow. Naively, I had failed to realise that the game was only nominally an away fixture for Spartak. They shared almost half the stadium and fans mixed openly on the metro. Despite the heavy police presence, relations were hardly amicable, and you could feel a bubbling undercurrent of tension between the two sets of fans. Walking closer to the ground from the station, there were more and more police and heavily armed guards. There were none of the sights, sounds and smells associated with the normal match-day experience in the UK; no cheering or songs from fans, nor the familiar wafting odours from chips and those other fast food delicacies we so admire. Instead, fans were subjected to seven instances of being patted down and two separate trips through metal detectors. And yet, despite the heavy-handed security and constant checks, it never felt safe within the ground. Flares were rife and fans were left to govern themselves. Police were happy to merely watch on as Spartak fans battled one another during the first half. Seemingly, the officials take the view that it is more trouble than it's worth to try and completely eradicate violent incidents at Russian football matches. The football on offer was less than stellar, but then you don't travel to Eastern Europe nowadays to witness quality, do you? Having endured so many dull Premiership affairs with little singing, overzealous stewarding, and the Fratellis blaring shamelessly over the loudspeaker system, it was a satisfying change of scenery. Spartak were led by a team of 'conductors' dotted throughout the crowd, who selected the different chants and fired the crowd up. Appearing poised to wade through the swarm of fans and assault anyone not singing, they ensured a much-enhanced atmosphere. I'd like to say I remembered some of the first half's play, but it was instantly forgettable with very few chances. I was too busy enjoying the atmosphere and desperately trying to avoid the eerie glare of the hooded hooligan orchestrator stationed directly in front of me. The second half was a much livelier affair - more for the incidents in the crowd. During the interval, rather than enjoy the Spartak-CSKA under-10s five-a-side match which was taking place (and roared on more vociferously than many an English game), some Spartak fans thought it a jolly good idea to run round to the CSKA end and steal their banner. Now a lot has been made about the Manchester City '35 years' banner at Old Trafford, but just imagine if some City fans snuck round to the Stretford End, stole the Ryan Giggs banner, and then proceeded to burn it in right front of the opposition fans' faces. Now consider that this took place in Russia, with fans itching for a fight and police uninterested in halting activities. As you might have guessed, all hell quickly broke loose. Around the top of the Luzhniki runs a concourse, similar to that at Hampden Park, although it is fenced off from the fans. Clearly irate, CSKA quickly began to tear up the fencing separating them from the concourse. The incensed mob then congregated and began to head towards the Spartak end. Up for the fight, the Spartak fans did the same and started their march towards the battlefield above the VIP seats. Realising that hundreds of warring fans inside a huge stadium might not be the best advert for Russian football, the riot police sprung into life and hurtled up the steps towards the concourse. The enormous riot police presence, now manfully brandishing their truncheons, managed to quell the sparring factions and, thankfully, the action on the pitch soon began to liven up. With ten minutes remaining, Ari, Spartak's Brazilian forward, sent a 20 yard right-footed drive past Igor Akinfeev and sent the sizeable away support into raptures. Faithful to the ineffectual performance that preceded the goal, CSKA failed to mount any kind of comeback in the remaining minutes. Spartak emerged victorious and the win pushed them towards the top of the table, albeit at a very early stage in the Russian season. But it wasn't over for those in the away end. After the tension and rioting from fans, those of us in the away end were kept behind for an hour whilst CSKA supporters vacated the area. Nothing could quell the din from the Spartak fans though - this was one in the eye for their close rivals, both on and off the pitch. 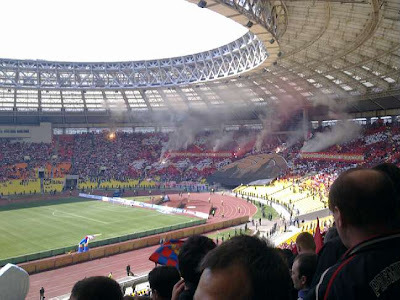 CSKA won the cup game - thanks to a penalty shoot-out after a 3-3 draw in normal time - and by burning Spartak's flag, gained some revenge for their opponents' act of derby-day desecration. Ooh, a report on football in Moscow one day before I leave for a week of football in Moscow tomorrow night. How appropriate! Thanks for the insights, Nick. Unfortunately, the Euro qualifier between Russia and Armenia I was going to watch at the Luzhniki has been moved to St. Petersburg. But there'll still be a number of lower league matches on and a full matchday in the RPL the following Friday (with Spartak at home). so interesting to read about your experience here in moscow! http://www.youtube.com/watch?v=dxyaTeDjZDs (cska-Spartak 30.04.Russian premier league).Final score 0-1.
http://www.youtube.com/watch?v=xd7EplDv5cc (Spartak-cska 11.05. 1\2 Russian Cup).Final score 3:3(4:5 penalty). Feel free to add more links and photos to your club. Everyone is welcome here.